I search around at a lot of websites and shopped for some replacement wheels for my old Ksyrium SL's. These are vintage 2005 with lots of miles. Unfortunately, the rim cracked and they don't make the replacement parts anymore, so I had to go out and replace with new wheels. I liked my old Mavic's so much I turned to the newer generation SLS for replacement. The newer wheels are even lighter and still very stiff and comfortable ride. Bonus in that they come with a set of tubes and tires. (still no flat..knock on wood) so I would have to rate them highly too. 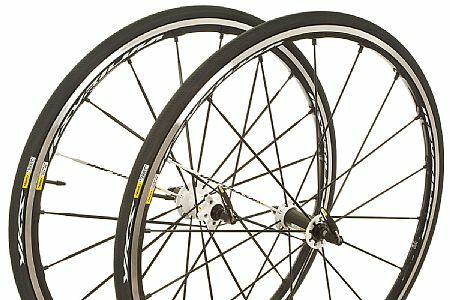 The Mavic tires are very comfortable, yet as responsive as the Michilin Pro4 I usually ride. Biketiresdirect is a retailer that I have used many times in the past. A new wheelset is the biggest item I have bought from them, but their service, price and quality of product was just as great as for the many times I have bought, tubes, tires, bibshorts, etc. I have used these wheels for over 10,000 miles and thought they were great until I broke a a spoke. My dealer was reluctant to order anything but a complete set for the back wheel which was very costly. I tried to contact the company directly but that was impossible. Finally the dealer contacted the dealer rep and they were able to send me a spoke under warranty. This all took over two weeks of great biking weather. The company rep said never put it on a bike rack with another bike. Any horizontal stress on the spoke might cause it to fail. I have since found a web site that sells single spokes and think that I will order a few just in case. 33 of 36 customers found this review helpful. My last set of Ksyrium's lasted 8 years - this includes a cross-country ride (2900 miles) in 2010. I live near the beach in Hawaii, and the salt air is brutally corrosive, but the wheels held up well. My new set ride just as well as the last set. I love the fact that the spokes are nearly indestructible, and the wheels remain true. These wheels are certainly worth the money.